Ever since we returned from the west coast and getting married, I've been battling feeling burned-out at work. Part of it is pretty standard work stuff: feeling like the things that go noticed are the bad things. The screw-ups or times when I've been a little less patient with someone. The things that go UN-noticed are when I spend two and a half extra hours at work to finish getting an entire section of dog food priced and labeled, or that I pick up after employees that don't finish their jobs before they finish their shift, or that I keep the website updated and the computers running. Maybe it's just that I'm a details person and my bosses are not. They don't notice this stuff unless I point it out to them and maybe I'm just getting tired of pointing it out. Or I'm just a whiner - anyone that has known me for long knows that I am quite capable of getting into my whining from time to time. I'm sure that I have it better than many people in this country. I have a job, first of all. Secondly, my job is what makes our life comfortable - my job is not necessary in our household income. Thirdly, I get to do something I really enjoy for the most part and many people NEVER get to experience that. I think that is was just a lot harder to leave Portland this time. 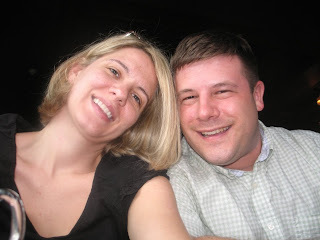 Scott and I both really felt at home when we were there for the wedding and it was emotionally VERY difficult to come back to Key West. 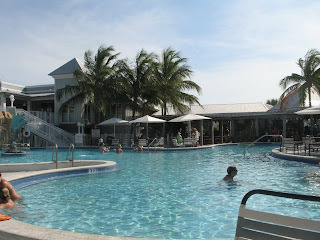 We have a few close friends in Key West, and good jobs, and a GREAT house, but we have family and a very close and large circle of friends in the Northwest. My dream would be to live in the Northwest in the summer and in Key West in the winter. People that have the flexibility to do that really have it made. Apparently Charlotte Russe isn't just a clothing store for teens and thirty-somethings pretending to be twenty-somethings (not unlike myself from time to time). I learned this last week on Girls' Day. Girls' Day is usually every Thursday. Jenny has Thursdays off without fail and I have most Thursdays off. Most weeks I go pick up Jenny downtown after I get off work Wednesday night and bring her back to our house, where she makes dinner and then we plot our adventures for the following day. This past week I was having a BAD DAY AT WORK on Wednesday (more about that later - I have to figure out how to talk about it without pulling a dooce). Scott picked Jenny up when he was off work and called to tell me that Jenny was going to make dinner and I was going to LOVE it. 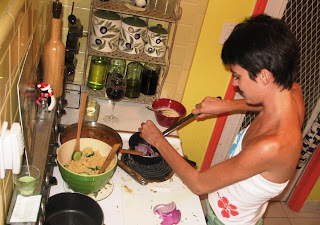 When I walked in the door to the kitchen, there she was, slaving away over a complex Mediterranean meal. 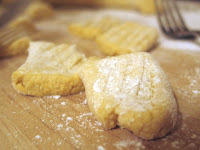 She had everything pretty much under control but wanted my help with some chickpea-ricotta gnocchi. Surprisingly, it was easier than expected and soon it was time for dinner! The appetizer part of the meal was pita slices and a cheese dip made from feta, cream cheese, garlic and several other spices. 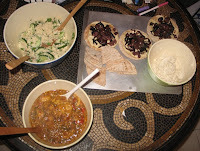 The next course was toasted pitas topped with humus, caramelized red onions and kalamata olives. We followed that with a cous-cous and english cucumber salad with lemon-yogurt dressing and fresh mint and parsley from our herb garden in the back yard. Our entree was the gnocchi in a tomato sauce that included coconut milk, onions, curry powder, coriander and several other yummy things. All the recipes excepting the pita pizzas were from one of Jenny's new cookbooks "How to Cook Everything Vegetarian" and it was ALL fantastic. The following day (Thursday) we slept in for a bit and then met up with our friend "Boots" for lunch at Pepe's. 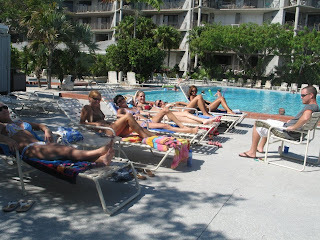 We all enjoyed different variants of grilled cheese sandwiches and then retired back to Boots' house to make dessert and spend some time by the pool. Through a series of events that are totally irrelevant, Boots has acquired a massive amount of ladyfingers. The obvious choice to some would be to make Tiramisu, but Boots is not a fan of coffee. 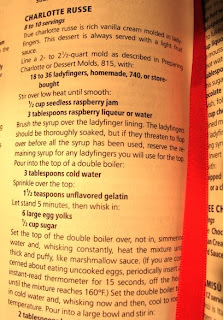 Jenny dug into another of her new cookbooks - The Joy of Cooking and found a recipe for Charlotte Russe. Boots contributed raspberry jam and raspberry liqeur, which I then painted over ladyfingers lining a bowl. 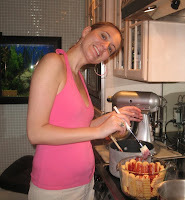 Meanwhile Jenny hand-whipped egg yolks, sugar and gelatin over a double-boiler to make a custard. 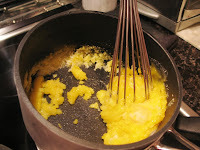 This requires about fifteen minutes of constant whipping to avoid the eggs starting to scramble. The custard was layered over the ladyfingers and about this time I read the end of the recipe and pointed out that it has to refrigerate for 8 hours before being consumed. Gah! Since it was clear we weren't going to be able to enjoy the fruits of our labor for some time, we decided to relax by the pool. When I chose my photographer for our wedding, I decided to use a long time friend. Scott was horrified saying "She should be IN the wedding, not taking pictures!" But I insisted. As it turned out, my gut feeling that this was the best choice was right on. Not only is she a talented and artistic photographer, but she is one of my closest friends and AS the photographer, we spent the entire day together. I got to see more of her than I did of my bridesmaids! 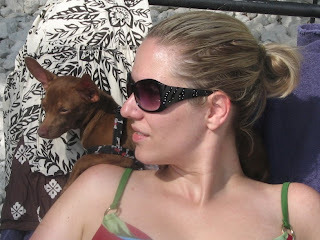 Erin brought along one of her friends to assist, and they have now posted a few of their pictures on Veronica's website. 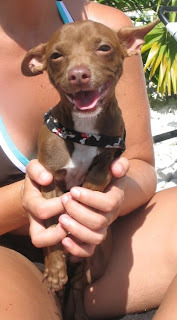 For those three of you that were reading my blogitude back in December, you may remember the Chihuahua that came home with me for Christmas Day and New Year's Day. I got to spend the afternoon with him and his parents at a pool that is open to the public. It seems that he remembers me, he climbed right up on my chair and wanted to snuggle. Not a bad way to spend a day off. My youngest "child" turned a year old while Scott and I were across the country getting married. 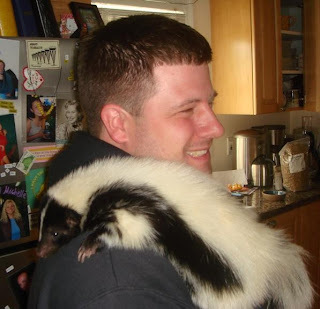 For those who have never heard or read the story of how I acquired a pet skunk, pay attention. Skunks are born in the spring. 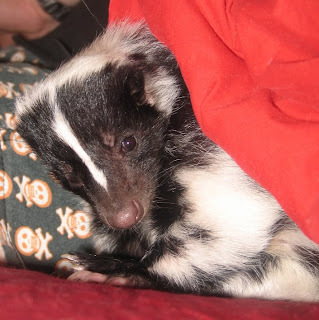 The majority of pet skunks in the United States are born and bred at Ruby's Fur Farm in Iowa. 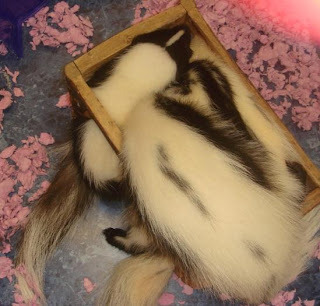 The baby skunks are descented early and then travel to pet stores around the country. 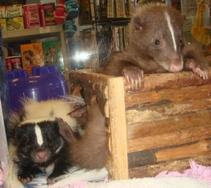 The pet store I manage brought in 7 baby skunks last spring. There was one apricot, one chocolate and 5 black and white. In Florida, a Class III Wildlife license is required to own a skunk (considered an "exotic") and the store requires proof of this license before the customer is allowed to purchase their skunk and take it home. Two of the skunks went home very quickly, as their new parent had anticipated their arrival and gotten the license process started ahead of time. The next skunk went soon after and that left four girls. Three black and white and the chocolate. 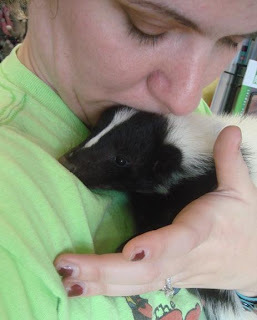 As soon as the skunks arrived all the store staff spent a lot of time with the babies, trying to get them used to being handled and socialized. Once there were only four left, we spent additional time with them and soon three of the remaining four found loving homes. The final baby was the smallest of all. Jen named her "Squirt". I wanted to ensure that whoever adopted her would have a loving pet so I started carrying her around with me every afternoon while I did my various duties. I let her sleep in my lap when using the computer, and had her in a small bed on the counter when running the register. 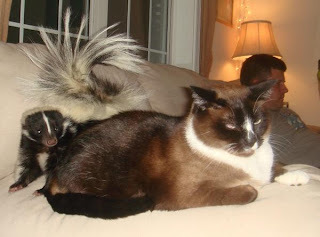 After a few weeks of this Jen (my boss) told me that she thought a friend of hers was going to get the skunk. I was happy for the skunk but a little sad because we'd started to bond a bit. For my birthday Jen and her husband Mike wanted to take Scott and I to dinner. We planned for them to pick us up after Jen closed the store (since I had the day off) and they arrived with a beautiful carrot cake and a big gift bag. I opened the bag and inside was a cardboard box. I opened the box and there she was! I was shocked and thrilled and terrified all at the same time - I knew Scott was going to FREAK OUT. When I opened the box Scott had his back to me cutting the cake. He turned around and saw me holding the skunk, then turned right back to the counter and said "How nice of you!" He didn't know what else to say! At first Scott was sure that Jen and I had planned this, but I assured him I had nothing to do with it and hadn't even considered getting a skunk, so I understood if he said "no." But I also encouraged him to come to the store and visit her (she had to live at the store until I could get my Class III License) and get to know her a little bit. A couple of days after my birthday Scott came by on his way home from work and agreed to hold her. She snuggled over his shoulder into his neck and he was instantly in love. We did a trial run with the dog and cats and then as soon as the license arrived we moved her into a cage in the corner of the living room and changed her name to Stinkerbell (aka The Stink, Stinkbug, StinkerPie and Skunky). Now she is very much a part of the family. We have had to baby proof the house to some extent, when we go to bed we put up gates across the kitchen doorway and the doorway to the bedrooms and put the dog's food bowl up on a chair. The evening is not complete until The Stink has waddled over to the couch, put her paws up and we bring her up for a snuggle. As I am typing this she is laying on my stomach with her head tucked into my elbow. We got married on a Saturday. Sunday morning we woke up, packed up our room at the Kennedy School, bought some souvenirs in the gift shop and then checked out. We spent the rest of the day saying goodbye to family as they left town and I took several naps. The end of the day found us at a Sushi-Land in Vancouver with Andy, Jenny and Jenny's friends from Seattle, Ian and Renata. I spilled an entire dish of soy sauce on my jeans. Monday was more sleep, some doing of laundry and more sleep. 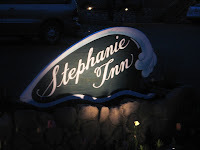 Tuesday morning we drove to Cannon Beach to check in to the Stephanie Inn. We arrived a little earlier than they expected us, so we drove down to Mo's and had a quick lunch. On returning to the hotel we were led on a quick tour by the bellman before being let into our room. Scott's sister and brother-in-law had purchased the "Relaxation" package for us, so there was Champagne and chocolate-covered strawberries on the coffee table near the fireplace, and candles and lavendar-confetti bubble bath in the bathroom next to the jumbo jacuzzi tub. We enjoyed two nights at the hotel, and two lovely buffet breakfasts in the upstairs dining room. The weather was a little cold but still beautiful enough to take a walk down the beach and take some snapshots of the hotel, the view and a cooperative seagull. There is a pizza restaurant in downtown Cannon Beach that has been there about 25 years, during which time I have patronized it at every opportunity. 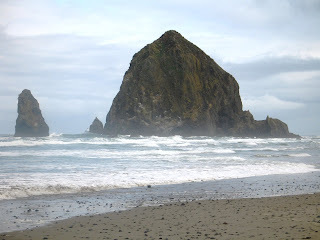 We enjoyed dinner there on Tuesday evening and then decided to drive to Seaside to try to find a camera battery charger. Once we were about 2 miles out of town Scott realized that he left his phone on the table. I circled around and headed back into town, and when Scott ducked in the door everyone in the place was waiting for him and gave him a hard time. We found a Rite-Aid that was open and after scouring the aisles for a charger, I gave up and purchased two disposable 35mm cameras. Wednesday we drove back to Seaside to enjoy dinner at McMenamins Sandtrap Inn. Our evenings were spent relaxing and watching episodes of Invader Zim.
" If you had told me two years ago that Reese would go to Vegas, meet a military man, quit her job and move to Key West, get engaged, ask me to be her Maid of Honor, and cut the cake with a sword, I would have hit you with a stick until you went away." I'm sitting on the couch with Buster, watching Unwrapped. Right now they're talking about HoHo's... the carmel variety in particular. In the almost two weeks since we returned from our wedding and honeymoon so much has happened! I've worked almost every day, as a result this week of our main cash-register computer obtaining a ton of viruses and going totally kaput. Either the owner or myself (sometimes both) were at the store nonstop for the last two and a half days. She spent the day today sleeping, which I fully intend to do on Sunday (my next scheduled day off). Our houseguest moved out today, to move back in with her boyfriend since they have decided to move to Orlando together in two weeks anyway. We are looking forward to being able to move back into our guest room, but we will miss her and hope she is making a good decision. I've discovered that I always get the best ideas for a blog post while I'm in the shower. I don't know what about the process inspires my mind to creativity anymore than I can figure out why I always think of CSI: Miami, Borders Books and Murder Mysteries every day while I'm counting out the cash drawer. The skunk has been thrilled to have us back, she has been up more frequently during our waking hours, so we have had lots of snuggle time. I managed to write about 3/4 of the Thank You notes last Sunday and mailed them in the last two days. I still have about 15 to go - but will be able to do them this weekend I'm pretty sure. We have been SO blessed by the generosity of those that love us so much! Our backyard near the gate is starting to look like the city dump because we've stacked up so many of the delivery/shipping boxes. Buster is dreaming. I should be.